Attention! Son-of-London ribbon does not work. You can get it but you will still receive V-1 Rockets. This bug happened to me some times… The bunker just all of a sudden places himself somewhere else. Do you guys know a way to prevent it? It took me a VERY long time to make… I might do a shorter version or record a gameplay. Please tell me if there is a way to upload this to the wiki. That is a great picture but sadly it will get bumped down on this Home Page. Again…to all: Post into the Forums so that you can use the IMG tags to directly show pictures as well as conserve your contribution to the site and get replies later on. I would like to thank the great community of this game, the creator of the game and the people who wrote the wiki. 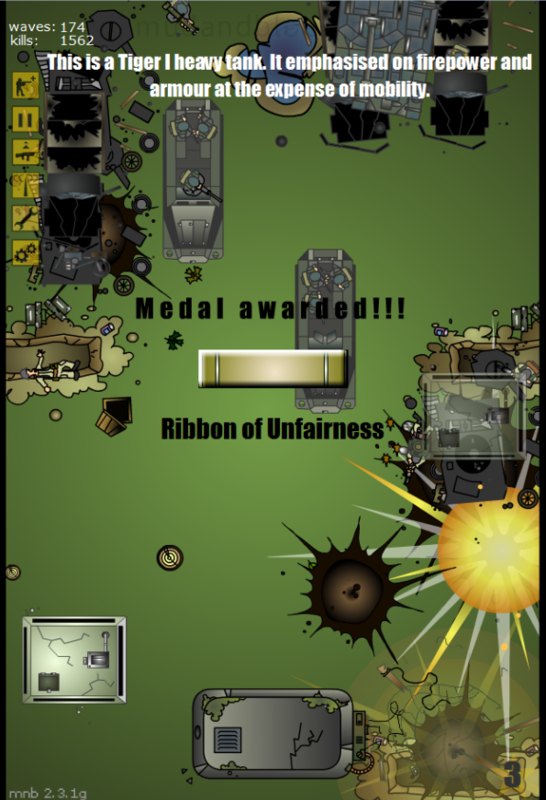 I can approve that this medal is extremely hard to achieve just as the wiki says. I would like to know the strategy you used. Getting 10 people to reply with a “Let’s see that Strategy!” answer will be hard but you could count me twice maybe. Wouldn’t mind seeing that strategy either! I am very interested in how you did this. Actually i don’t use zooks… My AT is only a tank and a lot of AT mines. But you are right about the bunker trenches. Awesome but post this stuff in the proper Forum or it will be lost soon. I think I will try that thanks!